Hi guys and gals, my name is Phil and I am from Swindon. Both my brother and myself are starting to get interested in airsoft, we've been once already and we both loved it. I have come on here to ask for advice as to what are the best beginners buys for guns. I have a general idea what I'd like but wanted to see what other people's opinions are first. I don't have a massive budget to spend at the moment but would be looking at about 300 quid to start me off. Thanks for taking the time to read this and I am looking forward to see what your replies are. Well, If you have a £300 Budget, don't get a £300 gun, you won't be able to afford to run it. a G&G M4 is a good base, and Usually (Depending on the version) £120 - £150. After that you can get all the things you need to run it (Battery's, charger, Mags, Etc.) And you could even get some Camo gear after that. I got a full British Army MTP Gear from a Surplus shop, In Swindon actually. about £40 for trousers and top. You can also get a Osprey vest for around £40, but that's if you want British army kit, If you just want what you need, then a Viper vest and some camo clothes will do fine. and after all that, You could probably get a low end GBB Pistol too, But Pistols are kinda unnecessary in Airsoft, especially if it's outdoors. If you do decide on a Gun, Its best to watch some videos on it, to see it fire, etc. But far better than that - See if you can go into a shop and look around (The only airsoft shop in Swindon is here: https://www.swindonairsoft.co.uk/) It's much better to get a feel for a gun before you buy it. If you have only ever played once and don't really know much about the kit do you think its really a good idea advising someone else on how to spend their money? Ehm bb's is like £7, batteries are £10, charger £20, so wow pay £30 upfront and after that ally you need to pay is £7 and your mains bill. And anyway a £300 gun will cost exactly the same to run as a £60 gun from twg? If you have only ever played once snd dont really know much about the kit do you think its really a good idea advising someone else on how to spend their money? I did warn him I'm probably not good at advice. Tbh, I've got nothing better to do atm. In fact I've got nothing to do at all. I thought I'd make use of all the hours of research I've done on Airsoft, you don't have to be Experienced to be knowledgeable. Well, I didn't mean actually shoot it, I just meant all the kit You'd get as a starter. But if you wanna run around in Jeans and a Hoodie, that's fine. I didn't mean to imply a More expensive gun costs more to run - I just meant that you wouldn't be able to get any more kit if you spent all your budget on a gun. No but first hand knowledge is very important when advising people where to spend their money. I know a fair bit about gas guns from research but haven't used them enough that I would ever advise anyone on which one to buy. To the OP you dont need loads of kit to start just decent eyepro and spend the rest buying the best gun that you can afford and most importantly like. No one ever had a good game because they were wearing camo or wearing a PC all that can be bought after. But your gun can have a big impact as its the second most important thing next to the player themselves. Yes there was a little typing error when using my phone but at least it was only one word not a whole post. Cheers for the replies guys. So what would be better? AEG or GBB for a beginner like myself? Probably an Aeg, best bit of advice is to go along and rent for a few games and look at what people are using. Most airsofters will gladly let you handle their weapon so thats a good way to get an idea of what feels right for you. How you want to play is your perogative but the op asked about guns. I wasn't offended in the slightest on the spelling comment I have rhino hide. Word of advice though airsoft is full of people who only want to look badass but real players loathe them. The best way to look badass is to casually stroll away from all the players whose hands are in the air because of you. Welcome . To echo some of what is said above, my advice would be to get good eyepro, 2 batteries and charger, a couple of spare mags, and spend the rest on a good AEG. Play in old clothes and built a 'load out' later. 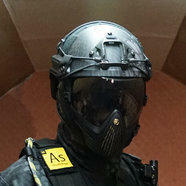 If you have not already seen this, http://www.airsoft-forums.co.uk/index.php/topic/12854-new-player-guides-info/. Have a read and also all the other sticky posts, lots of good information. If you are in Swindon then there are some good sites around, I would certainly recommend The Mall a great indoor CQB site and a place to meet several forum members. Anyone else from Swindon on here? Went to Badlands a Few weeks ago. Might even have been the same day as you. Well, By that I sorta meant in the equipment area, I didn't mean I'm not gonna try to play well, I just meant I'm not gonna squeeze every last bit of Performance out of my equipment. I went on Easter Sunday, was a good day! Haha, you going this weekend? You dont need to squeeze every last bit of performance out of your kit. But you do need to squeeze every bit out of yourself to get the best from playing airsoft. No need to apologise its all good. But for your info I didn't use emoji's as I was serious, just not offended there is a difference. It is always me that lets the side down, not the kit except that one time when ... . I was in the wrong position shooting or forgot to check my six before advancing, the guns worked well but I did not. Stil it is better to get stuck in than not. Never seen you let the side down you always get stuck in. I am always happy to have you next to me when I am pushing forward. Nah, Parents Haven't got the time unfortunately (I Don't drive yet) Plus I'm still collecting kit. Hi and welcome to forums and Airsoft in general, hopefully we can exchange plastic ball pleasantries one day. You state that you only have £300 to spend, with that ill assume it means everything! For your first gun definitely get an AEG NOT a GBBR, while GBBRs all have that realistic blowback action and recoil they are also more expensive to run and difficult compared to an AEG to repair. For a First gun i would recommend as other have done to get a G&G AEG, i would say stick to an M4 (AR-15) type weapon. Depending on what you want the gun made of you can go for a G&G Combat Machine M4, most have the name starting with CM16 as model numbers such as CM16 SRL, the receivers (main body) of the gun is made from a strong polymer plastic but the rail is normally made from metal, they are cheaper and lighter but of course not made of metal. The model above is the GC16 series such as the GC16 SRL which is exactly the same as the CM16 SRL except that the receivers made from metal. Above the CM16 and GC16 is the GT Advanced (AKA Top Tech Line), but in this territory its out of your budget, that said all the above guns function exactly the same, the gearbox (the working bits) are exactly the same as each of those guns, one will not perform better than the other just because it cost more, you pay more for aesthetics. Also if you buy any of those new fangled G&G guns with the Electronic Trigger Unit (ETU) make sure you use an 11.1v LiPo, regardless of the horror stories you have heard of 11.1v LiPos destroying AEGs etc a G&G gun with an ETU will NOT function, while it might for a 9.6v Nimh it wont do for long as the battery drains, but is guaranteed with an 11.1v. Also regardless of G&G gun they are all built to withstand 11.1v LiPos, i have exclusively ran 11.1v Lipos in my G&G HK 416 and MP5 with no issues. Lastly whilst i would say hold off before buying a pistol as they often dont see much use if your deadset on getting one i can only recommend you get one made by Tokyo Marui or TM for short, yes they are made in plastic and are limited to 280FPS due to TM being based in Japan and Japanese Law but trust me they are the best pistols out of the box, my TM M9 and TM FN-57 can range and even out range AEGs, failing that KSC/KWA is another decent brand, avoid WE like the plague. Also stick to common pistols, no point getting that awesome unique one when you cant find a holster for it. I have a TM M9, FN-57 and M1911, easy to find Blackhawk SERPA holsters for them, i also have a KSC M93R, yeah good luck finding a decent holster for it. In regards to kit get a a decent pair of boots, lots of those can be had from various surplus stores across the UK, stay away from British Standard Issue boots as a large quantity had QA issues with rubber soles crumbling away, try and aim for Pro Boots or any made by LOWA as they are decent in quality. Get decent Eye Pro, I cannot stress this enough, guns and kit be used and broken and replace but you only get once set of eyes, better not shoot them out, personally i use a pair of Revision Desert Locust Fan Goggles with Thermal Lenses (which annoying aren't available in the UK), the combination of fan and thermal lenses for me stops fogging. Gloves, anything on your hands is better than nothing, Mechanix do a wide variety of patterns and colours for a fairly reasonable price brand new. Clothes can be gathered as and when afterwards, nobody in Airsoft especially at skirmishes nobody cares if your are dressed like an elite operator out of Call of Duty or in t-shirt and jeans so long as you play fairly and take your hits. Tactical Gear such as vests and chest rigs, go with what you like, just remember you are carrying it, i used to go all Assaulted vested up with helmet and battle belt, man i was finding it a hard time moving around in the summer, nowadays i just use a chest rig (much lighter) and battle belt to carry other miscellaneous stuff. Comms: If you want a radio of sorts to speak to your bro get a normal (PMR 446) Motorola, they are decent enough for the job and as its a PMR446 radio you wont have to get a radio licence, if you decent to go all BAOFENG then you will need a radio licence, i dont know if OFCOM actively pursues people using them without a licence. Lastly thing i would mention is Optics, dont bother with long range scopes for an M4 you are simply not go to have the range to use it, instead if you do want scopes consider focusing on red dot sights or the like. Personally i field a Real EoTech 551 sight (with lens protector of course), since using a real steel sight i find i cannot use fake EoTechs any more, call me an optic snob. Last rule of thumb, you get what you pay for, i personally prefer to get most of my stuff real steel if possible, its sometimes a false economy to get clone stuff, a clone M9 Blackhawk SERPA holster i had always allowed the pistol to wobble and one day it hit the mag release catch and drop the mag mid skirmish (i found it luckily after wandering the woods retracing my steps), a real steel Blackhawk M9 SERPA holster had no wobble and a clear cut out to avoid magazine release bumps.